But the real question is why didn't the Dyke Marchers make the homophobic pastor feel more included and welcomed? 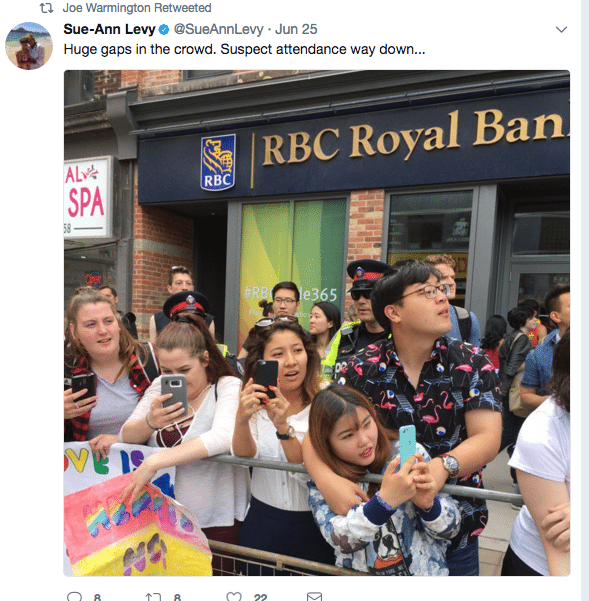 For someone who has so much hard-wired contempt for the city’s annual Pride Parade, Toronto Sun columnist Sue-Ann Levy certainly spent a lot of time thinking about it over the weekend, knocking out Hot Take after Hot Take, changing tactics every few hours, even if that meant taking positions that cancelled out the arguments she put forth in previous columns, hoping one of them would stick. This Sunday’s Pride parade will be the first in 22 years in which Brian Provini will not be marching. The 70-year-old gay man told me Friday he plans not only to boycott the Pride parade but he and his partner won’t even be walking Church St., which is closed to car traffic through the weekend. He says many of his friends are leaving the city for the weekend or avoiding the Gay Village or, like him, attending a small celebratory BBQ on Sunday. Provini says he’s also heard from some of his American friends that they have decided to bypass Toronto and attend Pride festivities in Montreal this year. 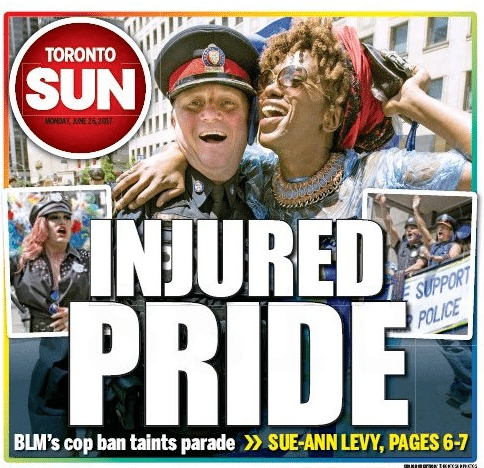 This has become more of reality (sic), he says, since they heard Toronto police have been banned from the parade and instead, a contingent of uniformed Toronto officers will be joining this Sunday’s New York City Pride parade. The retired community college professor is heartsick with what has happened to Pride. “I’m very disappointed,” he said. “I’ve been calling this a Black Lives Matter (BLM) Toronto Pride event…I don’t consider this Pride. After spending the first hour of Sunday’s Pride parade watching Prime Minister Justin Trudeau wave in his phony mannequin-like style to the crowds, I’d had enough. PM Selfie had already said something suitably vacuous about “celebrating inclusivity” and “respect for each other,” clearly not caring how silly he sounded given that banning all Toronto police and all forces around the province from marching — courtesy of Black Lives Matter-Toronto (BLM-Toronto) — isn’t what I’d call inclusive or respectful. As a gay woman I certainly didn’t feel “vulnerable” or “threatened” standing beside the constable, who deals with domestic violence cases out of 42 Division. For heaven’s sake, I found the security detail and the media relations woman working for PM Selfie far more intimidating. And what has BLM done? Slapping everyone who kowtowed to them in the face, they’ve opted not to march this year. Efforts to reach Nuamah and her PR flak Ryan Connelly were unsuccessful Saturday. Perhaps they’ve run for cover. But BLM is not listed as participants on their website, not as far as the main parade is concerned. Pride does not list the participants in the #ResistDykeMarch, so perhaps that’s where they’ll spew their hate. All I can say is game, set, match to BLM. 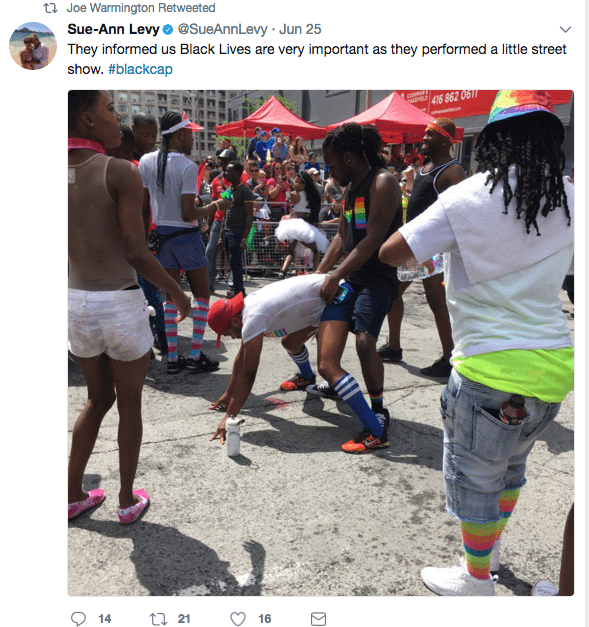 You would think Sue-Ann would at least be impressed that BLM stiffed Pride for the entry fee, as nothing makes her angrier than Pride receiving any kind of money (especially public money) but again, some people aren’t happy unless they’re not happy. Photo by Devin Jones for Torontoist. Inclusion didn’t mean Pastor Scott Park at the Dyke March Saturday felt included. But holding a sign up saying “God Loves You, Repent and come to Jesus” draws attention. Standing on the south-east corner of Carlton and Church Sts., it created such a scene that Toronto Police had settle things down. “They (a couple of women) ripped my sign and tried to grab my neck,” said Park. 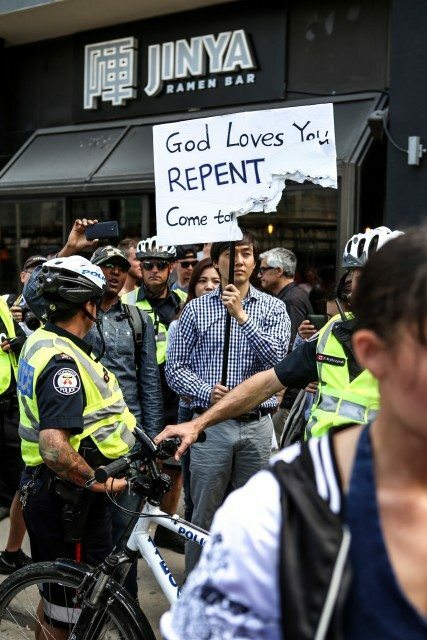 Even with a torn sign that left a lot of the message unseen, he remained as police officers on bikes surrounded him and protected his right to free speech. Most of the rest of the thousands of Dyke March participants just ignored him and his sign, but some challenged him. “So, are you saying because I’m lesbian, I need to repent my sins?” asked one woman. “No, I am a sinner as well, and Jesus is there for us,” he said. “So, would you go to another event and hold that sign?” she said. “Yes,” said Scott, adding however, “Try to assault me” before (sic).